A partnership between the NHL and MGM Resorts International is just the tip of an expected push by leagues to cash in on sports gambling. But whether that creates a revenue disparity between teams in gambling-friendly states and others like our future NHL franchise here in Washington remains to be seen. Our expected new National Hockey League franchise is positioned to make money off sports gambling despite this state boasting the nation’s toughest anti-gaming laws. Well, the NHL found a way to profit from gambling without actually doing so directly. A multiyear deal struck last week makes MGM Resorts International the league’s official gaming partner. MGM receives nonexclusive rights to league and team logos and branding material and — most important — real-time puck and player-tracking data currently under development. The data should help MGM set odds more accurately and opens up proposition betting opportunities — things like which player will average the hardest slap shot in a game, or log the most ice time — once technology is operational next season. NHL Seattle officials declined to comment until after a franchise is officially awarded here next month. Chris Stearns, a commissioner with the Washington State Gambling Commission, said he’s also unaware of anything preventing Seattle’s team from sharing revenue from the MGM deal. But Stearns said there could be an issue implementing the deal locally; namely, whether data being transmitted from future NHL games at KeyArena violates anti-gaming laws. “I think that’s something we’d probably need to take a little bit of a closer look at,’’ Stearns said. “If it’s just like statistics on when they entered the game or when they left; penalties, shots on goal or that kind of stuff, it’s probably just regular publicly available information even though it would be under a contract. That’s where this gets interesting, since the hockey deal involves “previously unseen enhanced NHL proprietary game data’’ according to a joint NHL and MGM release. NHL executive vice president Keith Wachtel told The Associated Press helping to set odds will be a prime benefit of the data. “They’re going to use it to be able to set odds and proper odds that they’re going to be able to create,” Wachtel said. So, this likely won’t be the last we hear on whether this deal will fly locally. This is just the start of a broad push by sports leagues to cash in on sports gambling after a U.S. Supreme Court ruling in May struck down the 1992 Professional and Amateur Sports Protection Act. The federal law had banned sports betting in all but a handful of exempted states. Now, individual states will decide whether to allow sports gaming. Nevada, Delaware, New Jersey, Mississippi, West Virginia and New Mexico do allow it, while Pennsylvania, Rhode Island and New York are close. Legislation to legalize it has been introduced in 19 other states, but not here — yet. The NBA and MLB have argued, unsuccessfully, that states should collect and pay them “integrity fees” — a sort of tax — on sports gambling, since it’s their games being wagered on. But since states have balked, these new partnerships are a way for leagues to get their gambling cut. Stearns said his commission — which enforces gaming laws but can’t enact or alter them — has kept abreast of the rapidly shifting sports landscape in anticipation of attempted legal changes here. 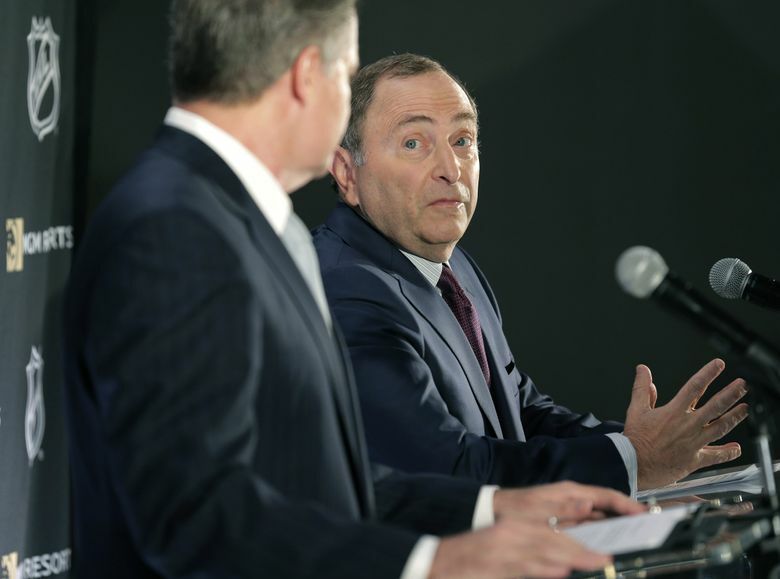 For now, the NHL’s partnership won’t bring a financial windfall to any one team. A July deal between the NBA and MGM was reportedly worth $25 million over three years and gambling on professional basketball far exceeds hockey. So, an NHL deal worth, say, half what the NBA got would see $12.5 million split 50-50 between players and owners, then divided among 32 teams. Seattle’s team at best would get less than a six-figure annual amount. In reality, Seattle’s team likely won’t see any NHL revenue sharing until it begins play in October 2020 or 2021. But it’s more the long-term implications that matter. The NHL partnership, unlike the NBA’s, isn’t exclusive, meaning it can pursue deals with other casinos and gaming interests. A recent Nielsen Sports study estimated the NHL’s slice of sports betting could top $200 million. Also, the MGM contract won’t preclude individual NHL teams from striking deals with gambling entities. MGM sponsors the Vegas Golden Knights, owns part of their home arena and maintains gambling kiosks inside. The Golden Knights also recently did a sponsorship deal with William Hill, which controls more than 100 sports books in Nevada. William Hill also announced a sponsorship with the New Jersey Devils last month that includes a sports lounge where fans can bet on a company app from inside that team’s arena. Depending on how lucrative those deals become, it could create a significant advantage for teams in gambling-friendly states. And perhaps a greater push to get legislation changed elsewhere. Conrad noted New Jersey’s sports-betting landscape has “exceeded expectations’’ in just a few months since it was legalized. And if teams elsewhere start raking in gambling cash, it’s only a matter of time before those situated here start pushing to level the playing field.